Why Do We Get To Old To Trick or Treat? There was a short discussion on Facebook today about when is it too old to stop going to trick or treat. It should never be too old. In the last week many discussions like this came up. Some people even lamented about the teenagers that showed, because Halloween should be for kids (that’s the argument). They are wrong – Halloween and Trick or Treating are for everyone. I have a theory of why people in my age group are complaining. Their parents complained about them. 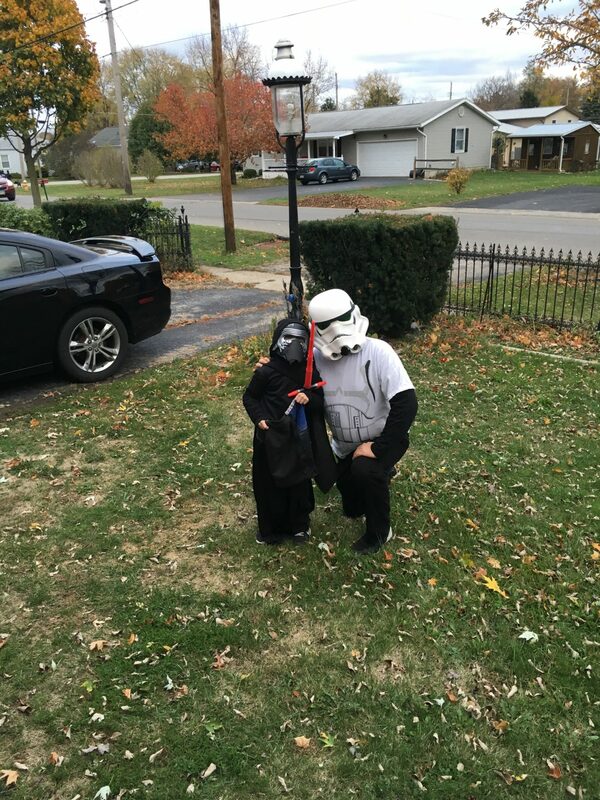 At some point they were no longer allowed to trick or treating. Since they weren’t allowed, why should anyone else at some arbitrary age or older be allowed? I’m sure this has been going on for generations. Why can’t we break the cycle? I will say that while I love all things Halloween, it was 1993 the last time I went trick or treating for myself. This was the Halloween of my senior year, I don’t remember for sure what I dressed up as – but I went. The following year at college I tried to get other people to go out – but it started. They parroted back the “we’re told old for this” mantra. At this point I never got to go collect candy from strangers again. This does bring up a good point though, shouldn’t you be talking to strangers and accepting candy be better at an older age than a younger one? In 1996 I went over to my girlfriend’s family and handed out candy. A group of teenagers from the haunted house I worked at were trick or treating. I handed out candy to them and talked for a minute and mourned my loss. I was 20 then. There is a reason this moment sticks out in my mind. I handed out candy to the 17-year-old girl who would be engaged to me 14 months later. This kicker to this – she doesn’t even remember it. in 1997 or 1998 I took my sisters around to collect candy, but I wasn’t in costume. If anything walking around in the midst of Halloween activities without a costume is a very depressing experience. It wasn’t until a few years ago that I started dressing up again. This was to take my son around and collect candy from strangers – once again, something we tell them never to do. I’ll dress up and take him as long as he will have me. We don’t hand out candy. The biggest reason these days is that we are out walking our son around the neighborhood. If that isn’t occurring we normally have plans on Halloween. We do the things that teenagers can’t – go to Halloween parties with alcohol. Somewhere between 13 and 21 we tell the kids they are too old to go trick or treating – yet too young to attend adult activities. They are lost and likely angry. They either won’t care and go trick or treating/get drunk underage or sit home bored, mourning their loss of youth. I told my wife that when we actually do hand out candy, that I want to make a ton of Jello shots in Dixie cups and hand them out to the parents and teenagers. Before I hear “OMG you can’t give teenagers Jello Shots” – I wasn’t going to actually put alcohol in them. I would watch the amuse faces of parents who would readily take them, the shocked views of people seeing me hand out shots to teens, and angry looks of people who would think I shouldn’t be doing it all. When they realized that there was no alcohol – I could just say it must be the trick and not the treat.